Heading in to the recording studio can be a daunting prospect, whether it's your first visit or your fiftieth! 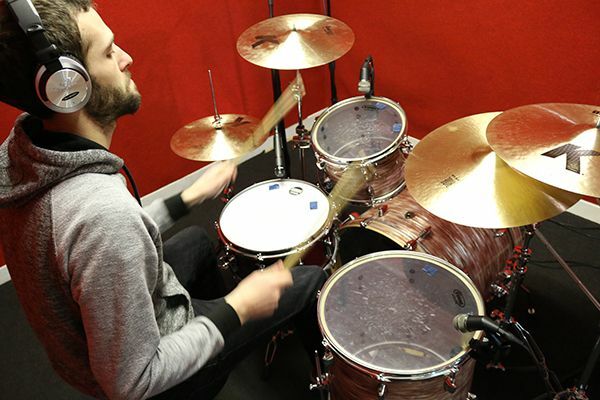 WDC Drum Specialist Matt Noades has put together a list of his top 5 tips for making sure your kit will sound and perform exactly the way you'd like before you start recording. Are your heads in good enough condition to record? If they are battered and no longer produce good enough tone or resonance, this will come across on the recording. Sound engineers can work wonders in the studio, but making an out of tune kit sound in tune is simply not yet achievable! If this is the case, it would be wise to re-head before you go to the studio. Think about the sound you want in the studio. Are you a hard hitter? Or do you play loud/heavy styles of music? Then you’ll want a thicker head, probably twin ply, to get the tone you need. You can even get heads with overtone control (like internal muffle rings) to help combat excessive ringing. In the studio, this will help you achieve a more solid, warm, punchy tone without the engineer having to excessively gate the drum, thus hindering the potential for a great drum sound. 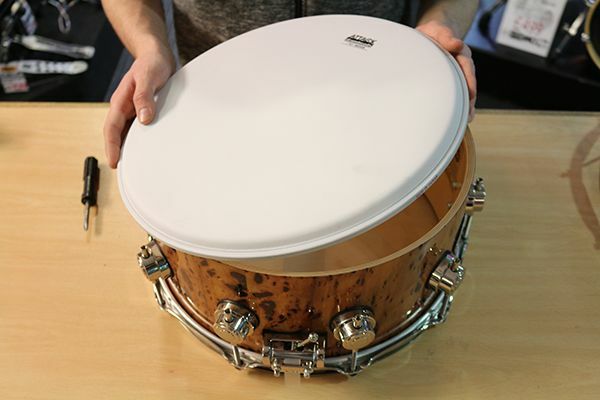 Lighter, jazzier players will most likely want thinner heads that allow more resonance and thus a more open drum tone. Coated or clear? In my experience, engineers quite often like coated heads because they produce a controlled, warmer tone with less attack; thus making the drum sounds easier to control and process in the mixing stage. However, don’t let that completely dictate your head choice, get heads that suit the sound you are after. Clear heads will give you more attack and more high-end response, perfect for rock/metal/gospel type drum sounds. If you are looking for a ‘clicky’ bass drum sound, a clear head will help you achieve this more than a coated head. This may seem obvious to some, but ensuring your drums are in tune BEFORE you get to the studio means less valuable studio time wasted. Unless you own/have free access to one, you’ll be paying for the studio and/or engineer, so you want to minimize time spent on setting up and maximize time for actual recording! Furthermore, the better your drums sound in the initial recording stage, the easier it is for the engineer to make them sound great in the mixing stage! Before attacking your drums with a key, think. Do they sound great already? Perhaps it’s better to leave them tuned as they are, in case you alter them for the worse and can’t return them to their original tuning. How are you getting your drums there? If you’re taking them in a car or van, don’t leave them in the car overnight, as a change in temperature can alter your drum tuning. 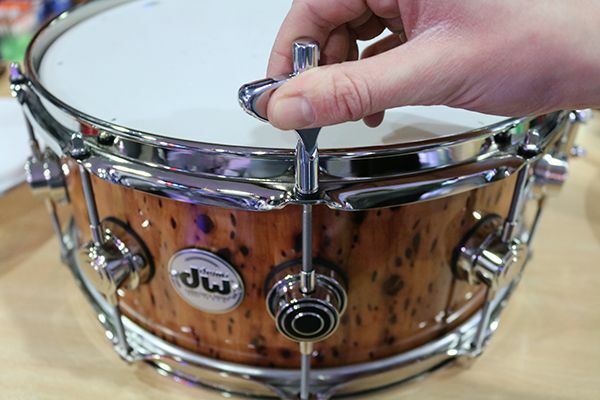 Are you wary of your drums losing their tuning? Then perhaps you can invest in some lug locks to help keep them in tune. They are small plastic squares that sit on the top of the tension rods, pressing against the hoop to help prevent them from loosening during playing. There are other alternatives to this, such as the Mark Richardson endorsed Tuner Fish. Tuning not your area of expertise? There are a variety of tuning tools you can use to help you get the sound you want. Torque keys are a simple, cheap solution; they work by adjusting each rod on the drum to the same torque set on the key itself. Tension watches work by measuring timpanic pressure on the head, rather than tension rod torque. This is a more expensive option, but very effective at tuning! Finally, you can now get digital drum tuners. These clip onto the hoop of the drum and help you tune via frequency readouts on each tension rod. You can save and recall your preferable tuning settings, and on some models you can even tune to musical notes. Before you hit the studio, it’s always good to do a little maintenance on your kit. You don’t want anything on your drums rattling or coming loose during your recording session. 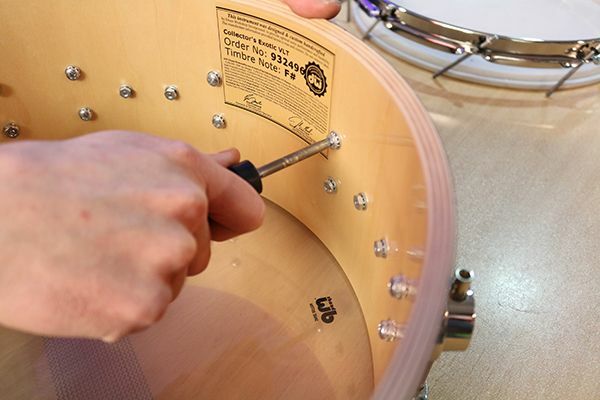 If you re-head your kit, take some time to ensure all the screws on the inside of the shell are nice and tight. Ensure all key bolts, wing bolts and screw fittings on the drum hardware are secure. Check to see your cymbal stands have all the correct felts, sleeves and washers etc to make sure you can both protect them and get the best sound out of them. Furthermore, ensure your stands AND drums have functioning rubber feet on their legs/spurs. You don’t want your drums or stands moving about mid recording! Dampening drums in the studio is commonplace; to control excessive overtones and assist the microphones in capturing the punchiest, warmest, and controlled tone straight away in the recording phase. You will find, however, that an engineer’s solution to this is quite often gaffa/electrical/masking tape all over your drum heads! While this might be a cheap and quick solution, it will leave glue residue all over your heads and in the worst case scenario, affect the resonant qualities of your head. So to avoid any of this, bring your own dampening! Studio O rings has always been a popular choice for the recording drummer; made from the same Mylar film that heads are made of, they sit around the edge of the drum and dampen excessive overtones. They come in kit configuration packs, as well as individual add on drum sizes to. A great trick with these is to take the batter head of the drum and place one of these rings on the resonant head inside the drum. This works particularly well on floor toms. Moongel (or the various incarnations of the same product) is a more versatile option. 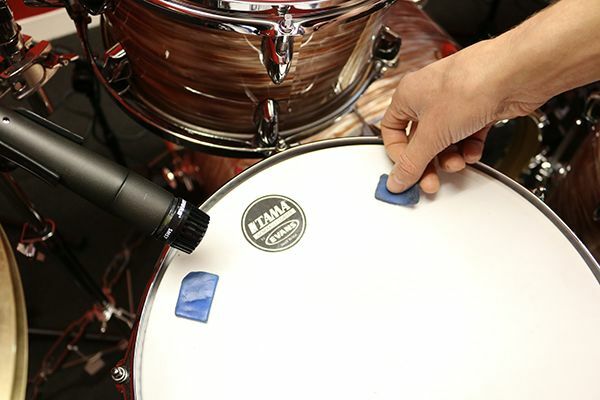 The self-adhesive pads stick to the drum head (and even cymbals) to control overtones. They are more versatile than O rings because you can control how much you put on and where you position them on the head. I even cut mine in half to create smaller pads for minimal dampening adjustments. They are washable (hand wash with warm soapy water then leave them to air dry), re-usable and won’t leave sticky glue residue all over your drums like gaffa tape will! For your bass drum, the old trick of putting a pillow or other soft item inside the shell works relatively well for tone control. There are a variety of pillow/foam based products on the market that replicate this with better features; such as Velcro attachment pads, microphone accommodation and ‘EQ’ conscious designs. Just be cautious of how much dampening you put in your drum, as you’ll start to lose to lose the tone of your drum and be left with just the attack. Alternatively, you can get heads with built in dampening, such the Evans EMAD or Remo Powerstroke PRO. This negates the need to fill your bass drum with the aforementioned products and thus avoiding the addition of excess weight. It is not uncommon for a studio to have a house kit. They’ll most likely know this kit inside out, have it set up and know how to get a great sound out of it. As a result of this, engineers often recommend using their kit to the drummer. Consider the nature of your recording. What are you playing? What kind of setup does it require? Do you really need to convey your personal sound on this recording? Do you think your kit will sound as good as the house kit? It might be easier for both yourself and the engineer to use their kit if you don’t require yours for the aforementioned reasons. They might have a Birch kit, which (arguably) lends itself to the studio environment better than a Maple kit. You could then bring just bring down your cymbals and snare to offer sound variation over their gear, saving time and energy! If you have/want to bring down your own kit, then consider what you actually need. Just because Simon Phillips might take his full set up to every session - regardless of what he’s playing - doesn’t mean you have to follow suit! A stripped back setup with just the essentials of what you need will save both time and space when setting up. If you’re doing a live recording, a stripped back setup will reduce the amount of channels required on the mixing desk, leaving more for the other instruments or even allowing for more creative microphone use to achieve a better drum sound. In conclusion, speak to the engineer in advance and organise all of this in advance to maximize the potential of your recording session. Listen to any advice they give, they might not be drummers, but they know what they’re talking about. Well, most of the time!